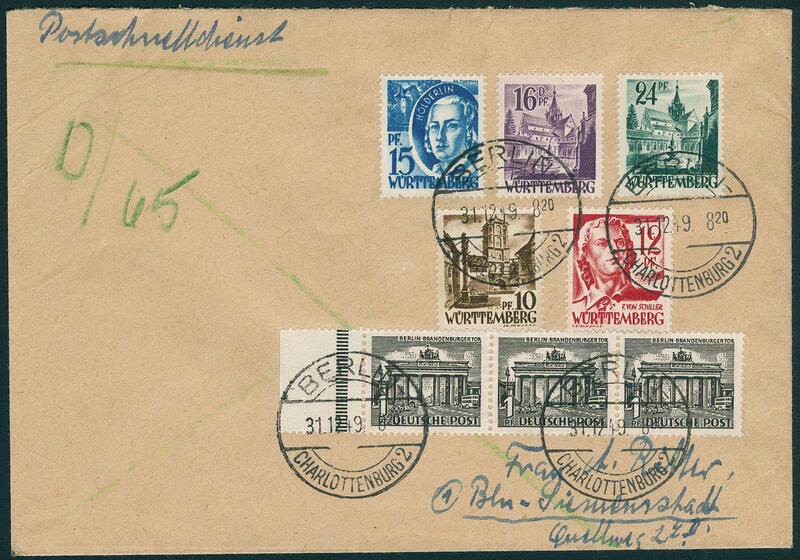 6468 ✉ 40 1 DM Stephan 1949, in perfect condition as correctly franked single franking on fast postal service card from \"BERLIN W15 4.5.49\", card left closed document punching, to Berlin-Friedenau with arrival postmark. In this kind extraordinarily rare! Photo expertize Schlegel BPP. 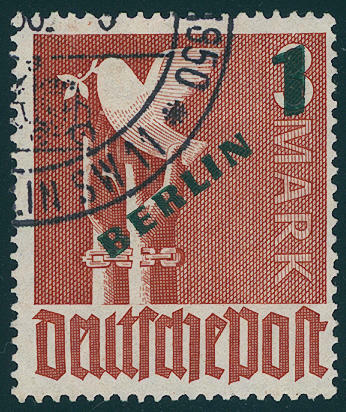 6469 40I 1 DM Stephan 1949 with very scarce plate flaw \"thickening in the foot of the second E from German\" from lower margin, in perfect condition mint never hinged there are only few examples from this known, due to missing offers by Michel catalogue only noted without price, expertized Schlegel BPP. 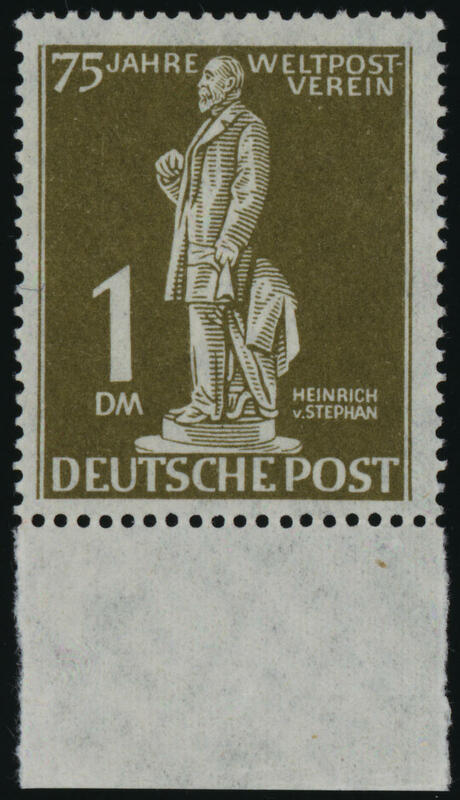 6470 41I 2 DM Stephan 1949 with plate flaw \"bulge at the bottom of monument base over S IN German\", fresh colors and very well perforated, in perfect condition mint never hinged, twice signed Schlegel BPP. Michel 400,- €. 6471 ✉ 42 1 Pfg. 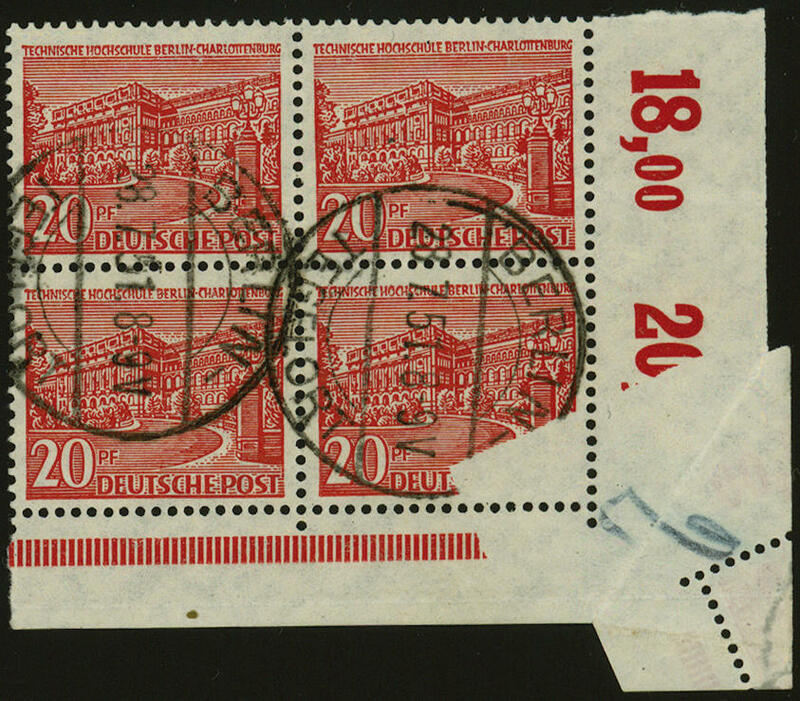 Buildings 1949, horizontal strip of three from margin in mixed franking with French zone Wuerttemberg 10, 12, 15, 16, 24 Pfg. 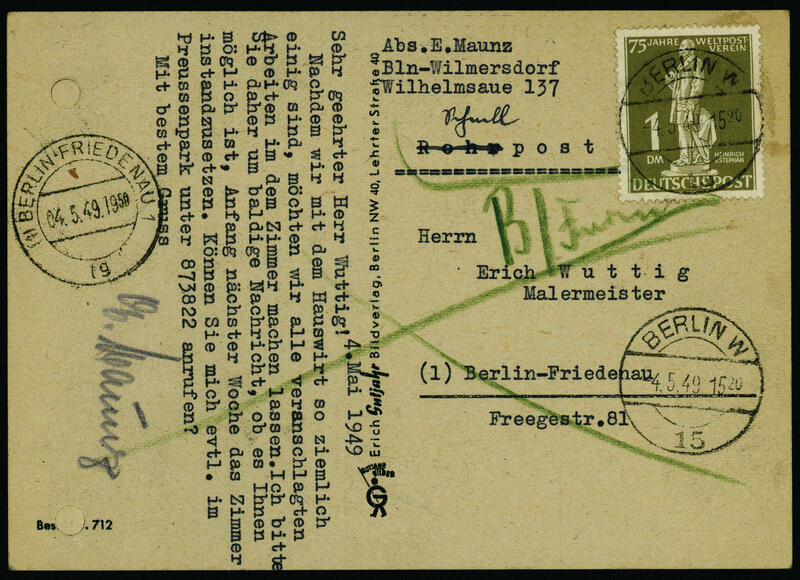 On correctly franked Postal service fast service letter from \"BERLIN-CHARLOTTENBURG 31.12.49. 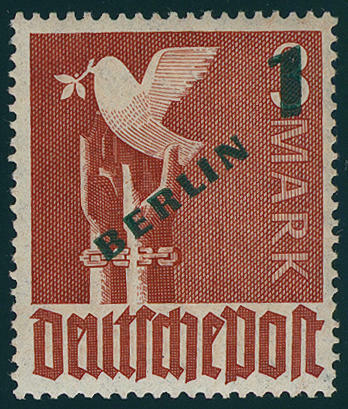 \" to BERLIN Siemens city with arrival postmark. 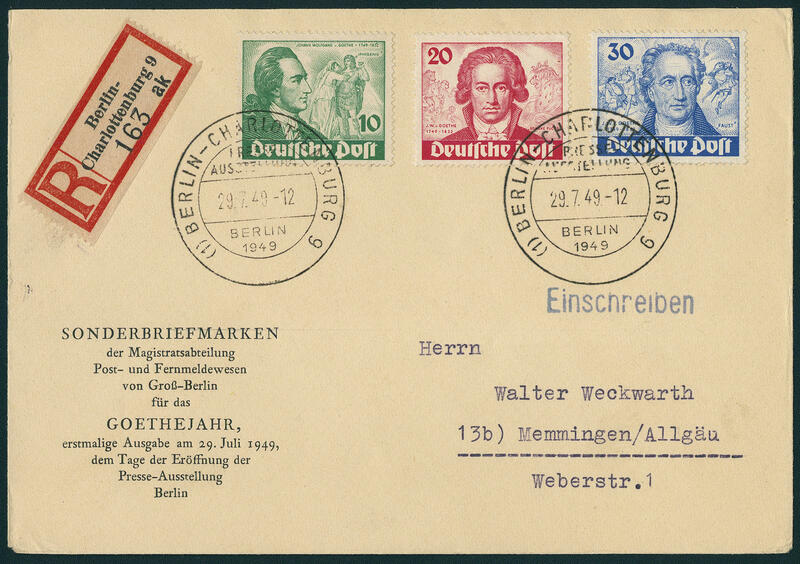 An extremely rare two countries franking on Postal service fast service letter! 6472 ∆ 42/58 1 Pfg. 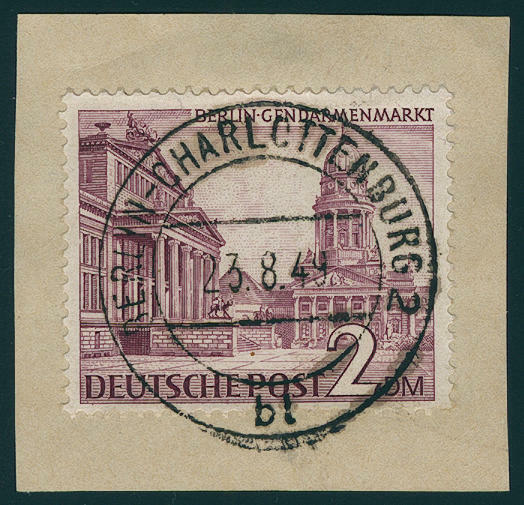 2 DM buildings 1949 on beautiful letter pieces, single perfect used \"BERLIN-CHARLOTTENBURG 23.8.49. \". 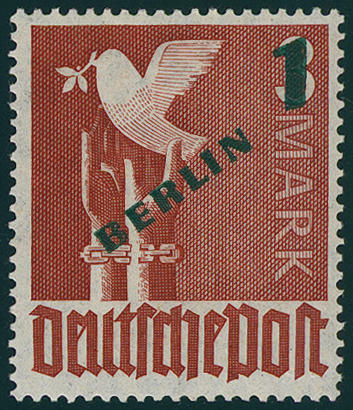 Very decorative and rare in this form! Photo expertize Hans-Dieter Schlegel BPP. 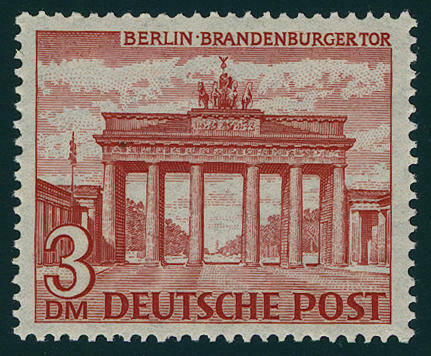 6473 42/60 Building set 1949, fresh colors and in perfect condition mint never hinged, all better values expertized Schlegel BPP. Michel 750,- €. 6474 ✉ 42HAN 1 Pfg. 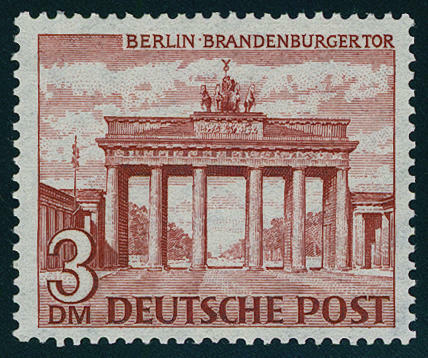 Brandenburg Gate, vertical margin pair with house order number \"515266.55 1\", in perfect condition with additional franking on correctly franked cover, cover outside of the franking folded, from \"Nuremberg 8.11.57. \", commercially in the local usage used. Rare! 6475 / 43U 4 Pfg. 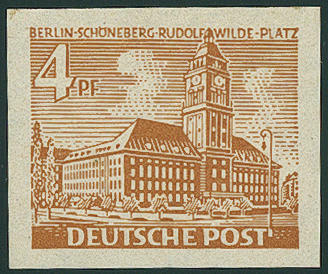 Buildings 1949, four sides with wide margins unperforated, nearly mint never hinged with only slight adherence trace left, scarce variety, expertized Richter. Michel 1200,- €. 6476 ⊙ 49Abart 20 Pfg. 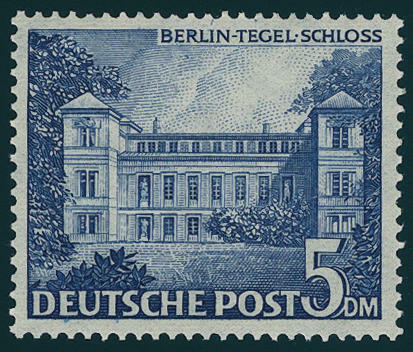 Buildings 1949, corner margin block of four lower right, neat cancelled \"BERLIN-TEGEL 28.7.51\". 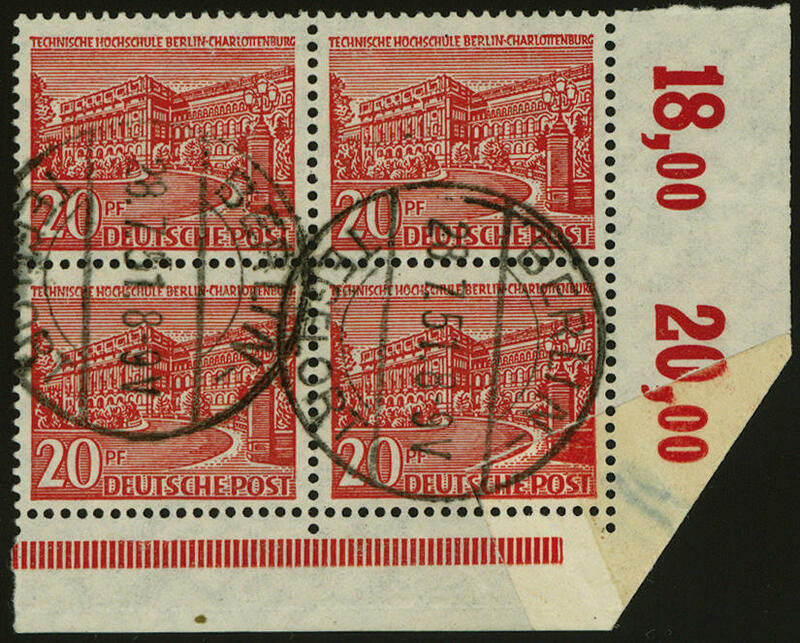 Through sheet fold is the printing of the right lower stamp partial on the gum side also the right lower metering digit is partly on the gum side printed. 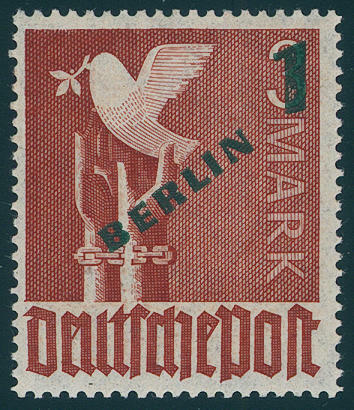 In this kind a spectacular and very decorative variety, because the controls the Federal Printing Office to the at that time time very stringent samples. 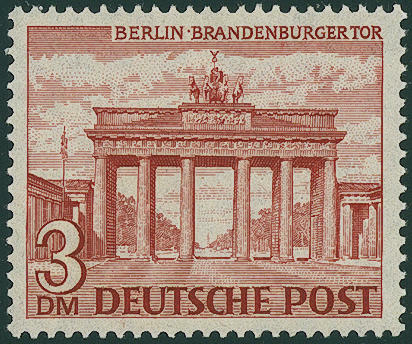 A Honor for the advanced Berlin special collection! Photo expertise Schlegel BPP. 6477 51Abart 30 Pfg. 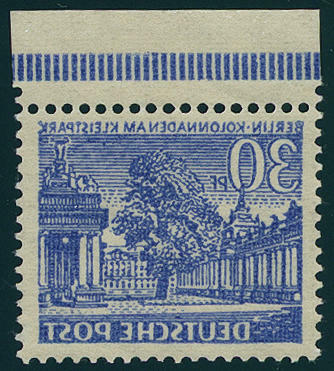 Buildings 1949 with pricked clear full copy on the gum side from upper margin, in perfect condition mint never hinged rare in this form! 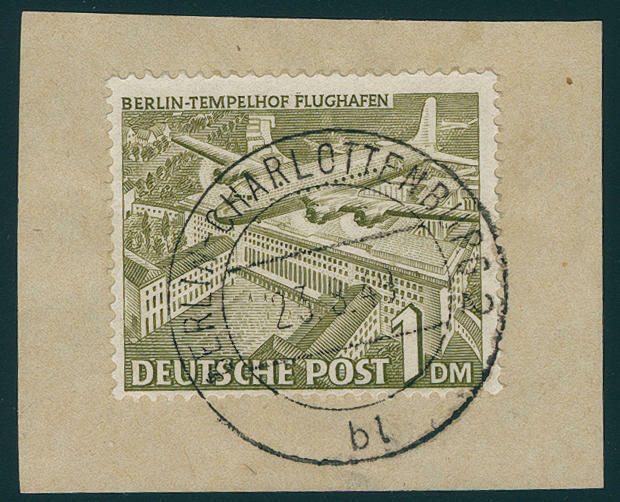 6478 ⊙ 57X 1 DM buildings 1949 watermarked X, neat cancelled \"BERLIN-CHARLOTTENBURG 1.12.55. \", expertized Schlegel BPP. Michel 150,- €. 6479 59/60 3 DM and 5 DM buildings 1949, in perfect condition mint never hinged, expertized Schlegel BPP. Michel 460,- €. 6481 60 5 DM buildings 1949, in perfect condition mint never hinged, without any signs. Michel 160,- €. 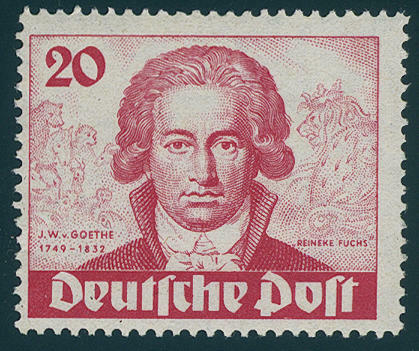 6482 61/63 Goethe set 1949, in perfect condition mint never hinged, without any signs. Michel 320,- €. 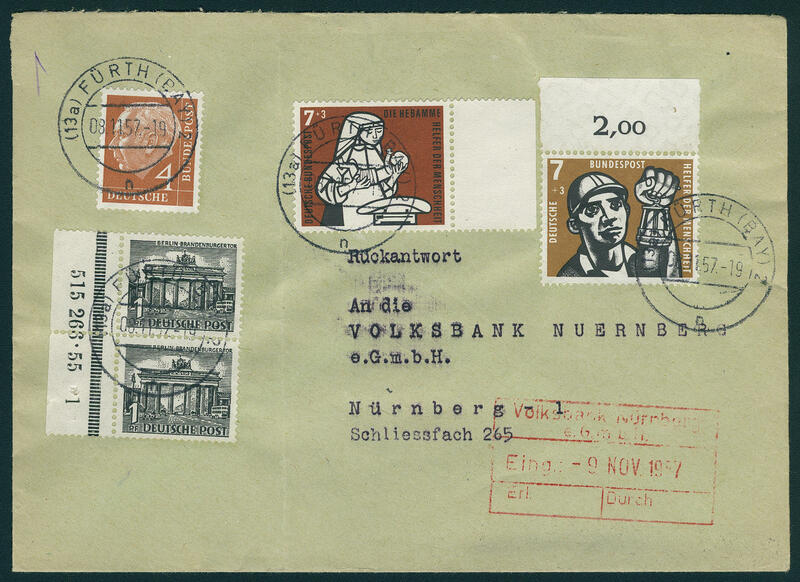 6484 64/67 Green overprint 1949, in perfect condition mint never hinged Michel 250,- €. 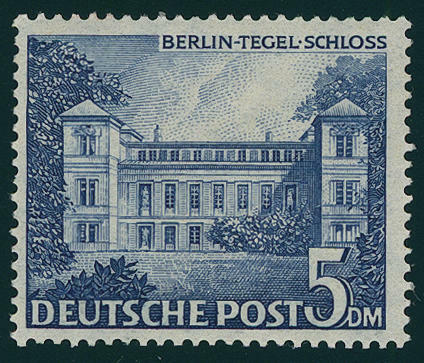 6485 64/67 Green overprint 1949, in perfect condition mint never hinged, expertized Schlegel BPP. Michel 250,- €. 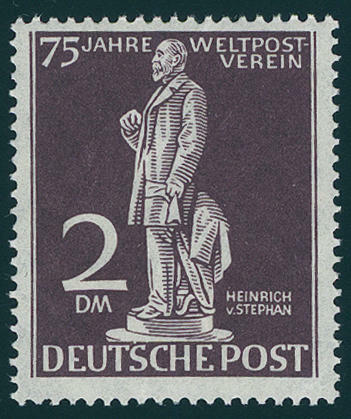 6486 64/67 Green overprint 1949, in perfect condition mint never hinged, expertized Schlegel BPP. Michel 250,- €. 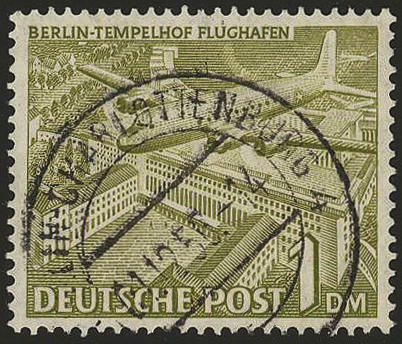 6487 ⊙ 64/67 Green overprint 1949, faultless set with special cancellation \"BERLIN foundation the regional Directorate of Post\".